There’s a full range of benefits for people who end up owning pets later in their lives. This article will discuss how important pets can be for seniors. A senior’s life can sometimes be a lonely one. Later on, when they’ve settled into the retired life and the kids have left home, it has become all the clearer to them how important pets are. These four-legged companions can bring a lot of joy and happiness into the lives of the elderly. The below section will discuss how beneficial pets can be for seniors. Increased social interactions. Pet dogs, for instance, require some exercise, which would mean the owner would have to get out of the house to walk them. This would not only lead to both the seniors and their dogs getting a light workout but more social interactions as well. They’ll be able to meet other dog owners and even become part of such a community. Better health. Having a pet, particularly a pet dog, can potentially lower cholesterol and blood pressure levels. The American Heart Association further explains that it is through the increased amount of exercise dog owners get from walking their dogs that contribute to reduced risks for high blood pressure and cholesterol. It has already been proven that both dogs and cats have this calming effect on their owners, reducing the risk of heart disease and lowering stress levels. More happiness. There is nothing like the happiness you get from adopting a pet. This can be especially evident in seniors who sometimes struggle to find a purpose at their age. With a pet to groom, bathe, dress, and take care of, they would no longer feel useless or lonely. Having a pet around means they would also have a new member of the family to shop or buy groceries for; not to mention, someone to love and keep them company. It’s these little, seemingly insignificant changes that bring a renewed purpose into a senior’s life. Loyal companionship. A pet dog, when raised the right way, can be the most loyal companion. No one deserves loyalty more than seniors. Your elderly parents and grandparents are currently experiencing the very difficult challenges that come with age. It is only fair that these experiences are counterbalanced with the unconditional love of their pets – the kind of love that gives hope. If you’re thinking about getting a pet for your elderly loved one, be sure to do your homework. Check reliable online resources or get recommendations from other senior pet owners out there. A simple online search of “the best pet for seniors” would also do the trick. You can even ask a pet expert for advice. Of course, it’s also just as vital thinking ahead. 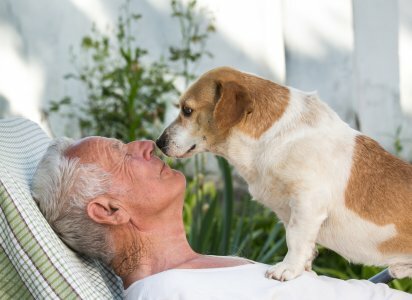 How would your elderly loved ones take care of their beloved pets? Make sure you cover all your bases to ensure that both your elderly loved one and their pets live a long, fulfilling lives. The Insured Pet is here to help. We are your loyal partners when it comes to pet health care and health insurance. For any inquiries regarding such matters, please get in touch with us today. Why Should Your Dog Have Insurance?